Australia’s road transport industry performs "quite poorly" in managing sleep and fatigue, a new parliamentary report finds. Bedtime Reading: Inquiry into Sleep Health Awareness in Australia estimates that four in 10 Australians struggle to get adequate sleep, a problem that costs the economy $26.2 billion annually and is estimated to have contributed to 3017 deaths in Australia in 2016-17 alone. Fatigue is a well-documented concern in road transport, as a sequence of recent efforts to tackle the issue highlight, but Melius Consulting director Dr Ian Dunican still rates the sector as performing "quite poorly" in this space, the report notes. 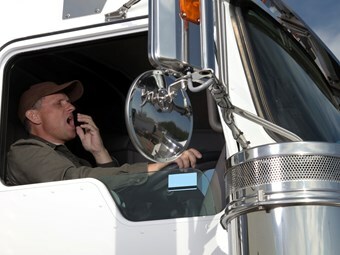 The reports quotes the stastic that 38 per cent of Australian truck drivers have experienced obstructive sleep apnoea (OPA) and "fatigue in the industry [has] been associated with increases in workplace and vehicle accidents". And, as regulations regarding road and rest times differ across states and territories, it can be difficult for transport companies that operate across state lines to manage. Dunican uses the example of Western Australia, where drivers "can drive 17 hours without taking small breaks" as fraught with danger, where reaction times in humans after operating such hours can deteriorate to the "equivalent of being intoxicated at 0.05 per cent". The Adelaide Institute for Sleep Health (AISH) makes the point, however, that there are "large individual differences" in the way people respond to inadequate sleep in the workplace, which poses a "significant clinical challenge" in how to recognise those who are at the highest risk of accident or error. It recommends the development of new guidelines for crash risk assessments for drivers with sleep apnoea, which should be "based on the latest science". The report also quotes the ACT government, which says Australia would benefit from "uniform national legislation providing regulations for drivers' working hours and minimum rest", using a European Union (EU) example where non-stop driving may not exceed 4.5 hours, and daily driving time cannot exceed nine hours in a day, or 56 in a week and 90 in a fortnight – albeit with a scope for flexibility in these limits. Dunican agrees that a "national guidance document across each state and territory regarding driving and rest times be developed in consultation with road transport stakeholders", but acknowledges the difficulties of making that a reality due to the "complexity" and "remote operations" of Australia’s industry. The report cites an example from Melbourne Sleep Disorders Centre’s (MSDC) medical director Dr John Swieca on one transport company’s proactive approach to sleep management. "One of the transport companies in Queensland … has actively investigated and treated sleep apnoea in transport drivers who do long-haul drives and the high prevalence of sleep apnoea," Swieca told the Senate recently. "They systematically have the patients assessed by a doctor, and, if appropriate, a sleep study performed. "The transport company actually rented out the CPAP [continuous positive airway pressure] equipment, the treatment equipment for the sleep apnoea, for the drivers every month for the first 12 months. "If a driver was consistent with treatment and was continuing to drive for that company, the company would buy the device outright. "They then went back to their insurer with that risk reduction strategy and negotiated lower premiums and lower excesses. "So, from an occupational health and safety point of view, that's a lovely example of closing the loop. It was better for the business and so much nicer for the employment." However, MSDC further explains that this type of best-practice approach from a workplace is "rare". The Transport Workers Union (TWU) says the issue is exacerbated by financial and time pressures placed on drivers, using the report to renew its calls for greater scrutiny higher up the supply chain. "This alarming report gives us additional cause for concern for the health and wellbeing of transport workers who all too often have no choice but to work fatigued," TWU national secretary Michael Kaine says. "Transport workers do not have the luxury of prioritising sleep when pay and conditions are worsening and insecure work is on the rise … [and] truck drivers are pressured to work longer and harder to make ends meet. "The only solution to ease the deadly pressure on transport workers is for the wealthy clients … at the top to ensure transport supply chains are properly funded and workers are receiving safe, fair and secure pay and conditions. "The Federal Government must step up and ensure the health and safety of transport workers is prioritised over profits at the top of supply chains."